Designed specifically the macOS, this is a good keyboard for Mac users. The Design of the XKEYLED is nearly perfect, and the Functionality is better than the included keyboard with a Mac or the built-in keyboard of a MacBook. The Build Quality leaves some room for improvement, and the Value creates a major decision point for potential buyers. If you are a dedicated macOS user and are not concerned about price, the XKEYLED is a fantastic keyboard. However, if the price is an important factor in your purchasing decisions, buying a comparable keyboard designed for Windows might be the better option. The Value of the XKEYLED is greatly dependant on what is most important to you in a keyboard. The overall quality of the product is high and would merit a recommendation on its own. However, the price of the keyboard is certainly a stumbling block. While everything in the Apple ecosystem is more expensive than its non-Apple counterparts, $60 for this keyboard is pretty high, especially when you consider that a keyboard with the same feature set from the top keyboard manufacturer for Windows PCs sells for $15. The Design of the XKEYLED is fairly simple, as the product itself is fairly simple. The key travel feels very natural, far more natural than an Apple-built keyboard. Unlike the chicklet keys on a MacBook, the keys are each raised at an angle that makes typing comfortable. The addition of backlighting of the characters, without major light bleed around keys themselves, makes seeing them in a darker room fantastic, a feature improved further with the easily adjusted backlight brightness. The only aspect of the Design that is a disappointment is the actual key movement. While far better than the current MacBook keyboard, the keys have more spring than a cheap keyboard would but don't even have the response of the older MacBook keyboard. With a slightly better key switch, the XKEYLED would be a perfect Mac keyboard design. Overall, the Build Quality of the XKEYLED is very high. All of the keycaps feel consistent, as do the switches that power the keys. No key feels different from the rest, which can affect any keyboard. The keycaps descend below the rim of the board, so there is no fear of catching something under a key. The bottom of the keyboard is not quite the same story, however. Some of the injection molding seams are not flat, making it really easy to cut yourself or snag things. If you were to travel with the keyboard in a bag, the rough edges might cause damage to the inside lining of the bag. In using the XKEYLED as my primary Mac keyboard, I found that the keyboard itself functioned incredibly well. I especially liked some of the features that the keyboard had, which the MacBook keyboard does not. For example, the dedicated screenshot key is great, as are the cut, copy, and paste keys. I also really liked how easily the backlight brightness can be adjusted with just the Function key and the arrow keys. The one thing that was a little strange about the Functionality was that the brightness adjustment process is completely different from the process for turning off the backlight. You would probably expect that, with three brightness settings, going down four notches would turn off the backlight entirely. Unfortunately, to turn off the backlight, there is a separate power button in the top-right, next to the key lock lights. This keyboard is different from most, in that it is designed specifically for macOS computers. The big difference between a Windows and macOS keyboard layout is the support keys on the bottom row. The XKEYLED has a similar bottom row layout, with Control, Option, and Command being on the left side of the Spacebar, and Command and Option being on the right side. This keyboard adds another Control key, as well as a dedicated Save key, to the right as well. One key is missing from the standard layout, however: the Function key. That is, instead, above the arrow keys. The XKEYLED mimics many of the standard Mac keyboard features while adding some new features of its own. For someone intimately familiar with the layout of the Function keys, you might be disappointed to learn that some of the keys have different behavior from what you're used to. Overall, however, the keyboard Compatibility is very high with Mac computers. The one limiting factor is that the keyboard plugs in with USB-A, while most new MacBooks are shipping with only USB-C, so definitely verify your setup before purchase. 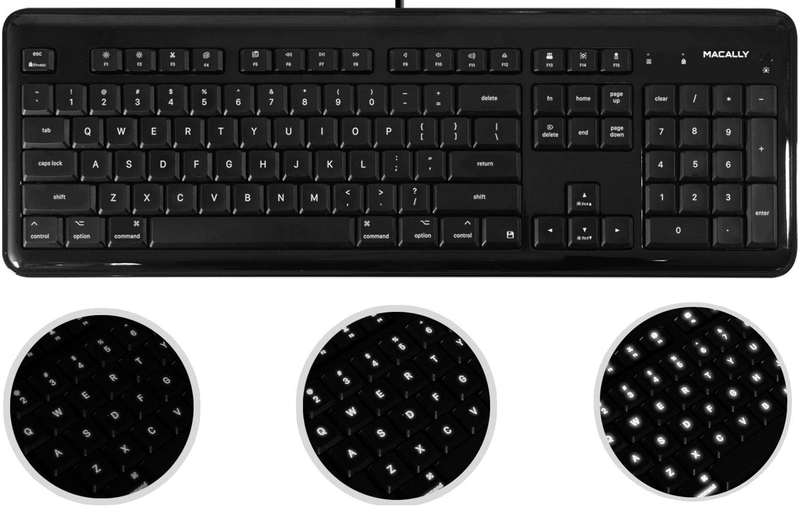 As with most keyboards, the setup process is very easy. For the most part, all that is needed is to plug the keyboard into your Mac and you're almost ready to go. macOS does have a keyboard configuration tool that will launch and ask you to press a few keys so that the operating system will know the layout of the keys on the keyboard. Once that is complete, the keyboard is ready for use. Our configuration took less than a minute from opening the box to being able to type.